Cracow Cathedral on Wawel hill is one of the most important churches in Poland; it is a great gothic building, created (in present form) in the 14th century. Unfortunately, even in case of such a high-profile investment (also in political terms), and in spite of spreading its completion for several decades, the budget has not been planned accurately. To make a long story short: the more of cathedral they have built, the less money was left to finish it. And almost nothing left for the decoration of the western façade. Nowadays façade does not seem too poor, but that is because most of it is covered by two side chapels (which, by the way, are rather nice), added in the 15th century. Without them the 14th century façade surely seemed rather empty – nevertheless, it does not mean that there is no decoration at all. On the contrary; we have some elements here that provide a political message. 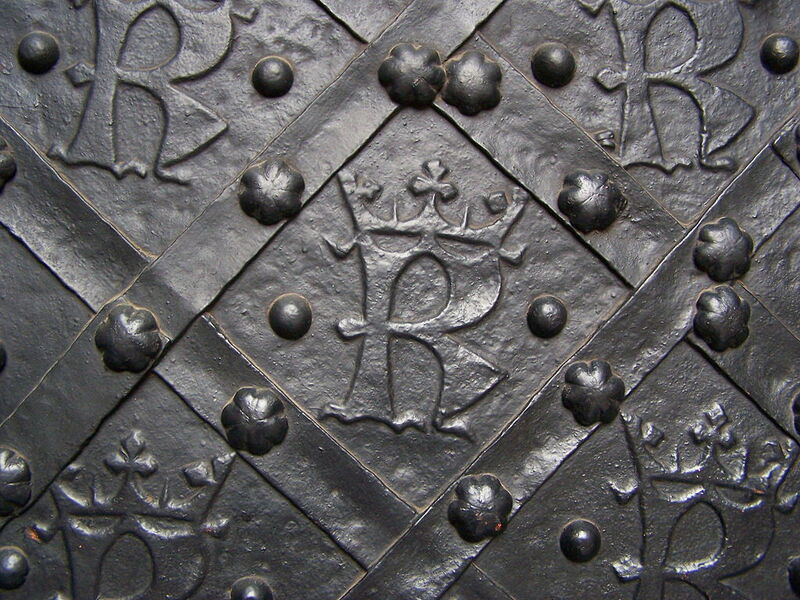 There is a shield with coat of arms of the Kingdom of Poland (the White Eagle), and the doors are decorated with the monogram of Polish king, Casimir the Great (letter “K” covered with a crown). The cathedral was consecrated in March 1364 and a couple months later there was a major international event in Cracow (meeting of European monarchs). As prof. Marek Walczak suggested (in his book on architectural sculpture in Lesser Poland at the time of Casimir the Great), it seems that the cathedral’s façade has been completed, probably in a hurry, before that event took place. 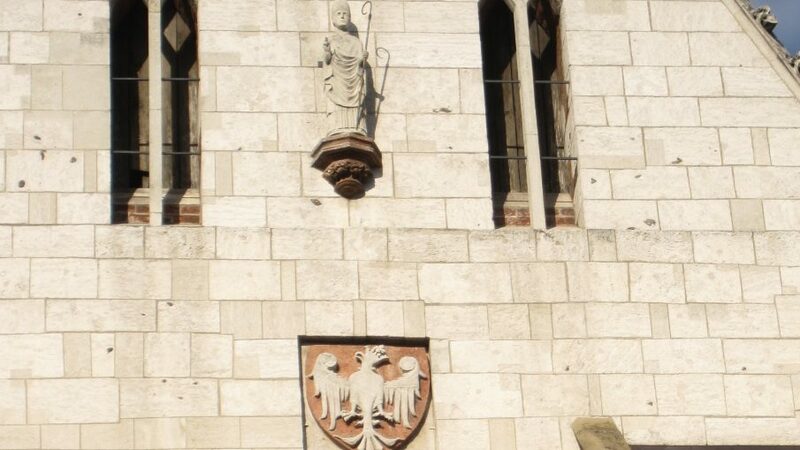 Obviously, the host of cathedral also wanted to be marked on the façade: below the Polish coat of arms with Eagle, we may see another coat of arms: Poraj (a rose), which belonged to the then bishop of Cracow, Bodzanta. The coat of arms is switched; it is so called “heraldic bow” (heraldic courtesy), and it expresses the respect towards state’s coat or arms and a figure of St Stanislaus, placed above. 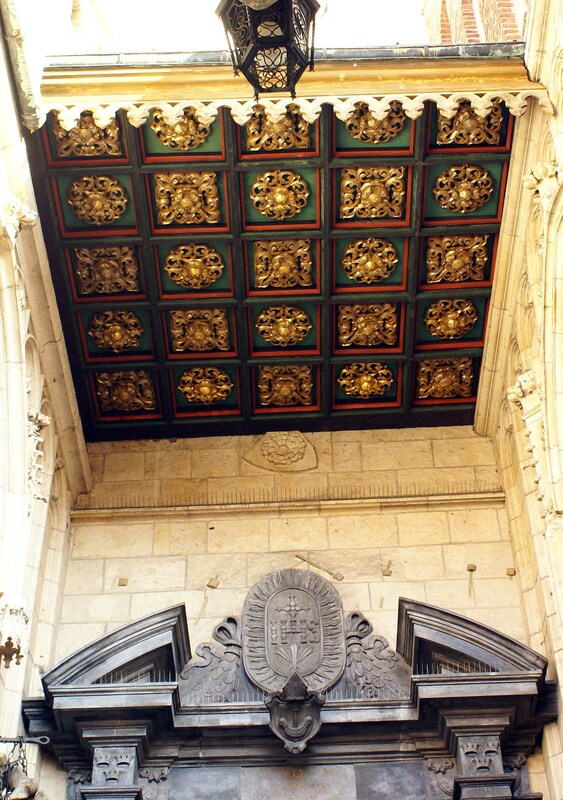 Today the Poraj coat of arms is barely noticed, stuck between seventeenth-century additions (a roof over the entrance and a baroque portal). 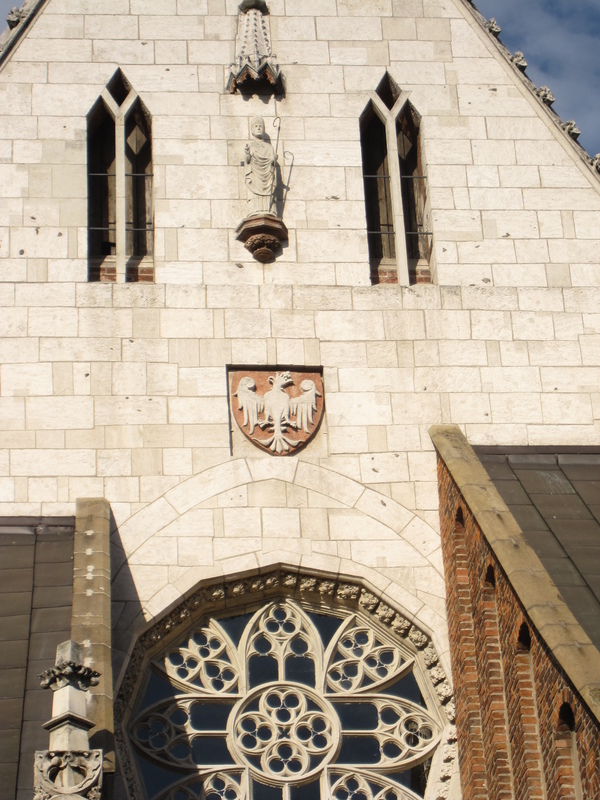 On the top of a gothic façade there is a figure of one of the cathedral’s patrons and the most important saint of Cracow: it is bishop St Stanislaus, whose relics are venerated in this cathedral. 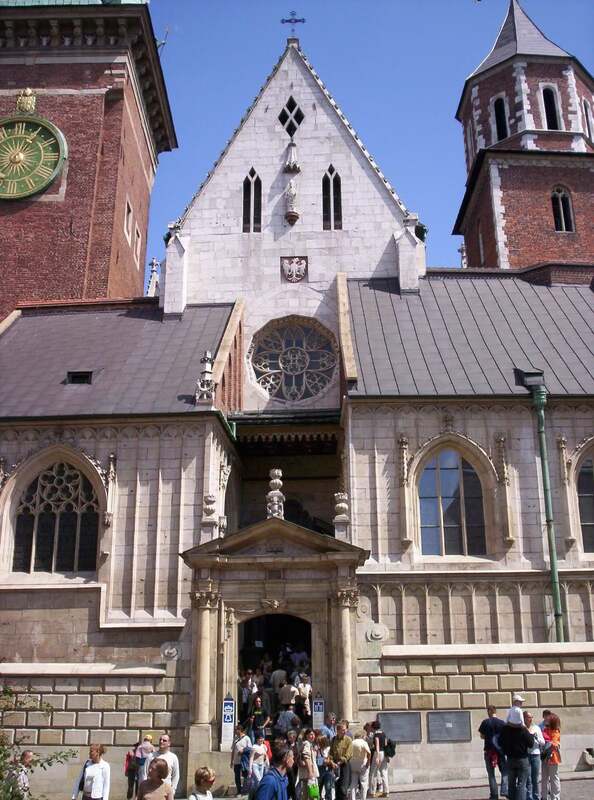 Today the façade is decorated with a copy of the 14th-century sculpture, made by Zygmunt Langman at the end of the 19th century; the original may be seen at the exhibition “Lost Wawel” in the castle by the cathedral. 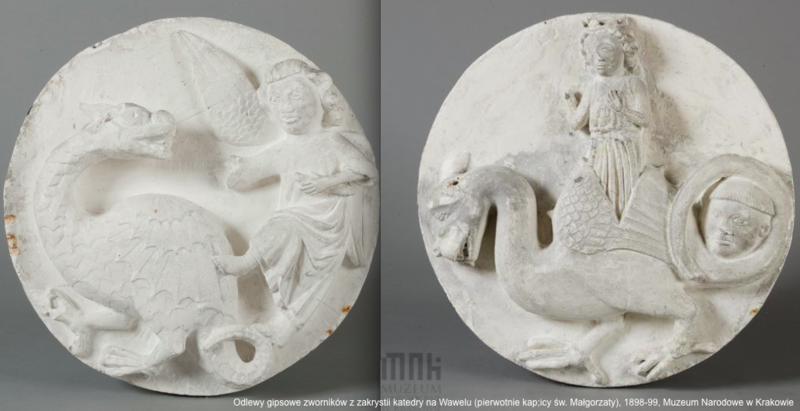 It is not a high-quality piece of sculpture; some scholars used to assume that it dates back to the 13th century, and that it is a relic of a previous Romanesque cathedral in Cracow. That hypothesis has been rejected though; stylistic forms of this sculpture indicate that it dates back to the second half of the 14th century. It is not “ancient” or “archaic”, it is simply artistically poor. Most likely, to cut the costs, they have employed a cheap inexperienced sculptor. The figure of St Stanislaus was not a big problem: when a sculpture is so placed so high on a façade, no-one can really appreciate its artistic value (or notice the lack of it). The very different situation is in case of portal: that is the decoration everybody watches closely. And so they decided that as they did not have money to hire high-quality sculptors to create new sculptures, they could use some old sculptures they already had. 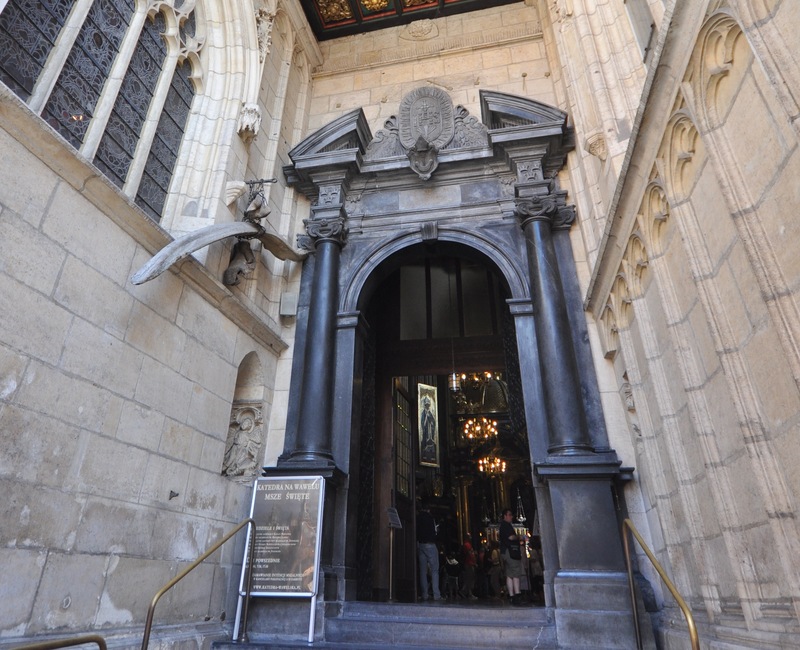 As a result, they have placed reliefs depicting St Margaret and St Michael, created about 40 years earlier, on the sides of the entrance to the cathedral. 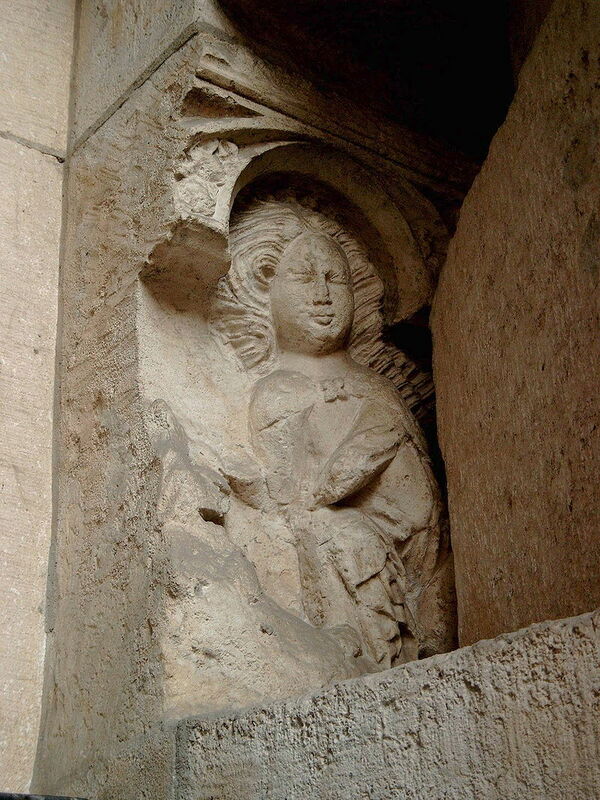 Most likely those reliefs used to be parts of a stone altar-piece from St Margaret Chapel. That chapel later became a sacristy of the cathedral, and it is the oldest part of a gothic cathedral, built in the 1320s. It seems that the then Cracow bishop, called Nanker, planned this chapel as his burial place. Finally he was not buried in Cracow at all, as after he quarreled with the king, he was removed from Cracow and became bishop of Wrocław in 1327. Already in the 14th century his chapel was turned into sacristy. The altar was removed, but some of original decoration survived: there are still sculpted keys on the vault, depicting also St Margaret and St Michael. Those saints have a common attribute: a dragon. 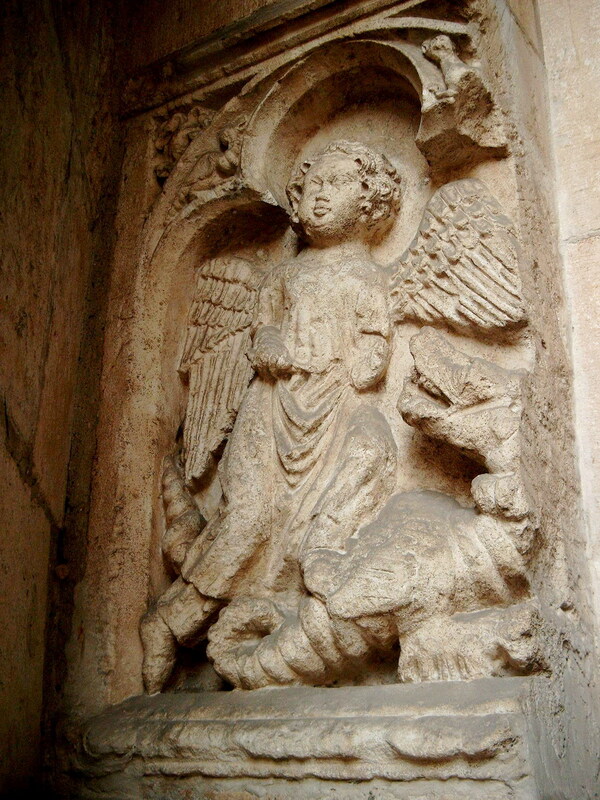 The reliefs from the altar of that chapel have been placed in a western façade, and when the side chapels were built in the 15th century, the special niches were cut so the sculptures are still accessible. Those images are the only relics of all the 14th-century altarpieces from Cracow cathedral – nothing else survived. We may actually say that those reliefs survived thanks to the problems with closing the budget of the gothic cathedral in Cracow. Or, alternatively, that it may be the proof of thriftiness that Cracow citizens are famous for: we always try to re-use old items instead of throwing them away.